As you all are probably aware by now I am doing everything I can to to make my hair Healthier, stronger and especially LONGER. My goodness what does a girl have to do around here to get natural lovely long locks??? Well it is simple…. 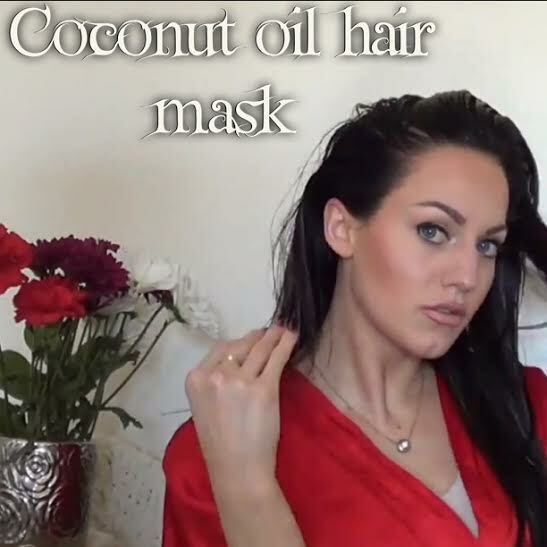 put coconut oil in your hair! Duh?!? I cannot believe it took me this long to do it, I really have noticed an amazing difference. That being said it is important to do other daily things to take care of your hair such as: brush it, use a natural shampoo, use a heat protector. All things we have all heard before really do make a difference. I am obsessed with a new found hair line called PHYTO it is all natural and has changed my hair, I swear by it. Another new found item is a hair brush made with boar hair, the boar hair in the brush makes your hair silky and smooth. And ladies, another thing to do which I am horrible at, because I think I am a hair hoarder, is get a trim! You guys I just got a trim yesterday, nothing huge just to get rid of my dead ends and then she went through and trimmed off all my split ends, getting a trim this way takes off very little length and makes your hair thicker at the ends and look super healthy, like night and day difference. So as Elsa would say “Let it go” I think it was her that said that LOL. As for the coconut oil mask, obviously it has to be raw organic coconut oil. It is one of the only oils able to penetrate the hair shaft and moisturize hair from within! This seriously is my beauty secret, who ever said diamonds are a girls best friend, clearly had never used coconut oil. It beautifies you from the inside out. I eat it for my health, I use it on my face, & on my hair, I love it. The coconut oil conditions, moisturizes, prevents wrinkles, evens out skin tone, reduces the appearance of scars, not to mention it’s a nutritious cooking oil! So jump on the coconut band wagon it will not do you any wrong. I have provided a You-tube tutorial below for my hair mask, if you have any further questions please comment below. Let me know how it goes! Enjoy the tutorial! I love organic coconut oil too. It’s the best treatment for hair. It took me way too long to figure that out too. Your hair looks awesome btw. Thanks hon I am obsessed with it! Coconut oil never seems to amaze me. I’m excited to check out your hacks! I love using coconut oil, It helps my liven up my dyed blonde hair! Great Post!! Thanks hon, but yeah it is a miracle worker! I am excited to see your results! Thanks for sharing your secret! I will need to try this on my hair because I’m trying to grow it longer but still want to keep it healthy. Yeah for sure I’m excited to see the results! Ya be sure to tell me how it goes! It is you will have to try it! I keep hearing about using coconut oil for hair and I have yet to give it a try! My hair is so damaged–Ill have to try it and let you know how it goes. Yes do it is amazing! I am excited to hear about your results! I have heard a lot of amazing things about coconut oil. I have to try this. Thanks for sharing! Well that is a great problem to have I am excited to check out your post! You totally should!!!! It is a game changer! I have heard such good and positive things about using coconut oil! I really need to get on this bandwagon and start using some! Thanks so much for bringing this to my attention! Yes of course, it really is amazing ! Yea! coconut is great to taken care of hair. Coconut oil is THE best!! I have extremely frizzy natural curly hair and the coconut oil has really made a difference! There is a link under my photo for some coconut oil on amazon that is under $20! Which is a great deal for the amount you are getting. Hope this helps, every girl deserves luscious locks! Yeah of course! You should try it out, let me know how it goes! Thank you for the tipps! Me too, it literally does everything for you! Awesome let me know what you think! Happy Monday! Glad I stopped by! I’m SO inspired by this! Coconut oil is SO good!! Heyy girl! Thanks it is awesome you should try it out! Yes I love this! Coconut oil is a beautiful thing! I love using coconut oil on my hair too as it does help to moisturize the hair! Love the scent of coconut so I sometimes use coconut oil as a face moisturizer too! Me too I love it! I feel like I use it for everything!